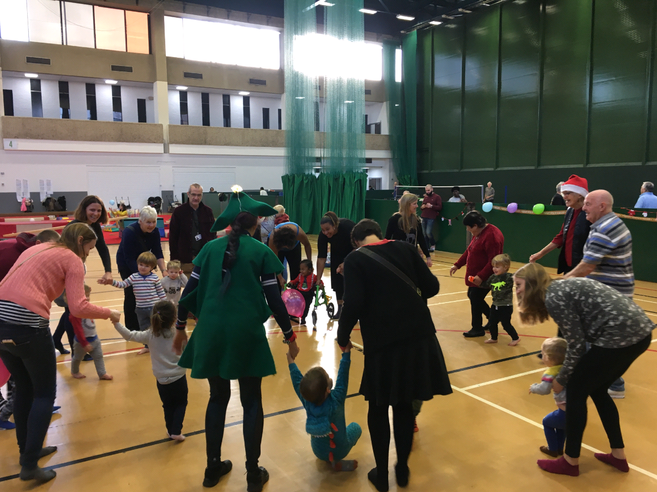 On Tuesday 11th of December, Islington’s Community Sport team put on their annual Better Get Together (BGT) Christmas party at Sobell Leisure Centre but this year with a twist as it was incorporated with the parent & toddler gymnastics session on the neighbouring court. The party was attended by at least 65 people (43 aged 60+ and 22 toddlers) plus guardians, staff and a young man with Down’s Syndrome (who has been attending BGT for a few months) with his support worker. The group danced and played together casually before a more structured Zumba session, the synchronised Macarena being a highlight with virtually all ages being represented. The party was a great success and both groups said that they really enjoyed interacting with each other. Inspired by Channel 4 programme Old People's Home for 4 Year Olds it is a format that will be repeated next year.